Graters are graters, right? A box with four sides, options for slicing, rough cut, fine, finest. 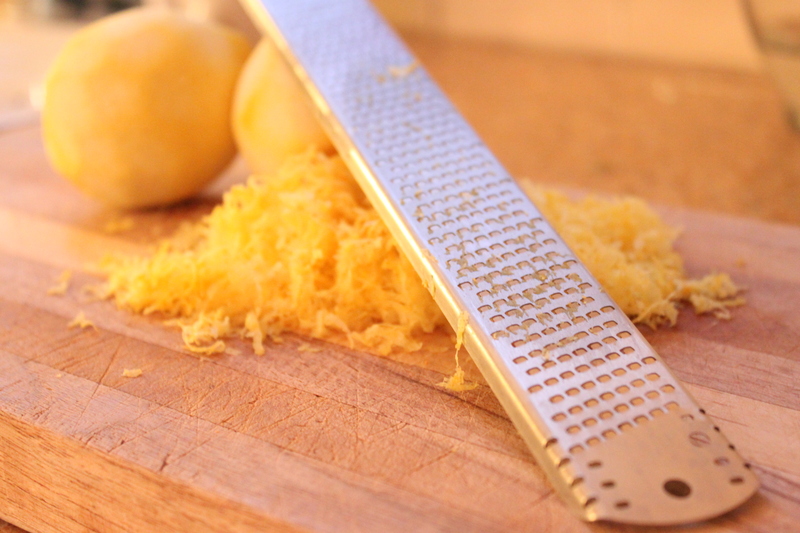 When you remove zest from a lemon, a box grater skins your knuckles along with the fruit. And if you forget to soak that classic box grater, well, then, forget getting all the little bitties out of those tiny rough-edged holes. I bought my Microplane grater early in Microplane’s shift from the tool bench to the kitchen: My zester doesn’t have the fancy handle that most now do. It’s just a long strip of stainless steel with squared holes, their leading edge ever-so-subtly shaped. I worried at first about holding the thing, but soon realized it would not bite the way a regular grater does: The single-direction cut, narrow field, and one’s ability to position the “plane” makes it almost impossible to damage either your holding hand or the knuckles of your grating hand. I use this most often for taking zest off lemons or oranges. The pile of golden shavings that accumulates — fast and freely — is astounding. There’s an estimate floating out there that Microplanes double the amount of zest you can get from one lemon. How? Well, the edges are much sharper than any other grater you own, nothing is left behind on the tool…and it’s fun, so you just keep going. That increased yield plays havoc with the recipe instruction “add the grated peel of one lemon.” For me, a lover of lemon, the added punch is terrific. If you are not such a fanatic, you’ll want to consider adding grated peel to your dough or dish in stages, to ensure that your new grater isn’t giving you TOO much lemony goodness. Microplanes are available in a bunch of different sizes and shapes. My go-to for lemon zesting is the finest one; I also have the medium for grating hard cheeses and chocolate. Here in DC, Microplanes are available at one of my favorite neighborhood stores, Home Rule, along with kitchen and hardware stores. You’ll want to have this in hand before you make Lemon Buttermilk Pie or Lemon Sponge. Your tastebuds — and your knuckles — will thank you. Sea, kosher and table: Which salt shall I use? Enter your email address (below) to subscribe to "Baking Family" and receive new posts by email. We won't ever sell or rent your name! Click after entering e-mail above! I would add that the Microplane box grater is a fantastic kitchen addition. Expensive (for a box grater), but worth every penny. It has been my “hostess present” for two years now. Baking Family blog by Betsy Garside is licensed under a Creative Commons Attribution-NonCommercial-NoDerivs 3.0 Unported License.